Organization Bio: The not-for-profit association for Canadian communication agencies, representing 75%+ of all national advertising. 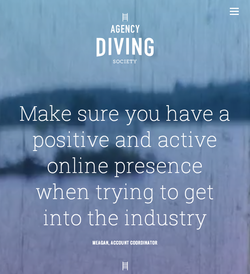 I was responsible for developing, executing and polishing copy for the Agency Diving Society. Target Audience: Students and young professionals with an interest in pursuing a career in the advertising industry. Business Objective: To deliver an additional value-added resource to educate new entrants to the advertising industry, and serve as a portal for ICA member agencies to connect with potential new recruits.